Stroll along the beach or on the pier and watch the surfers at some of California's best surfing breaks. Soak up the sun while lying on the beach, swim, boogie board, or watch the sunset. Beach chairs, umbrellas, boogie boards and fishing equipment are included. The many restaurants to sample include Italian, Mexican, Chinese, Thai and Fisherman's on the pier. Also great cafes for breakfast and lunches. We are now your Green Holiday choice in San Clemente! Solar Electric panels on the roof produce our own electricity. Amenities: Enjoy a beach holiday year round in this spacious, fully-furnished apartment with a completely remodeled kitchen with new granite counter tops and appliances Also included is a new interactive flat screen TV with cable, DVD, VCR, stereo system and laundry facilities. Additional TVs in Master bedroom and queen bedroom and DVD player in bunk room. Three bedrooms and two newly renovated baths easily sleeps seven. The master bedroom has a Cal king memory foam bed, and a private tiled deck with gas bar-b-cue and deck furniture, bedroom-2 has a new comfortable Queen bed, Bedroom-3 has a bunk bed and separate twin bed. Inflatable beds are available for extra children on request. Activities: Enjoy the beach and fishing pier just a short walk away, or visit nearby Dana Point Harbor, Laguna Beach, and Mission San Juan Capistrano. Also, several golf courses are available in the area. Nearby shops include everything you need plus antiques, swimwear, surf shops, post office, and arts and crafts. Also the public library is only one half block away and every Sunday there is a Farmer's Market just up the street. We get only great reviews from our guests seeking a memorable summer holiday or a winter refuge from the cold. We also offer special discounted rates for stays of 12-29 nights for $135 per night. We have been in the vacation rental business in San Clemente since 2000 and have met many wonderful people as a result. We really enjoy sharing our home and beautiful San Clemente with people on vacation or escaping from uncomfortable weather back home. We strive to keep our rentals clean and comfortable and take every opportunity to make upgrades. We are proud to provide the quality of accommodations that bring many of our guests returning to stay with us year after year. Location! 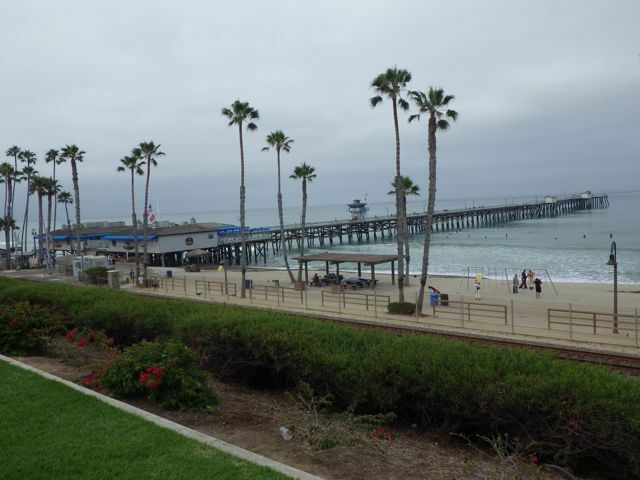 San Clemente is a small beach community that is perfect for vacationing. We are walking distance from downtown shopping and restaurants and the main beach and pier. We are also halfway between Los Angeles and San Diego and are able to take advantage of everything these two great cities have to offer. We are located on the coast in South Orange County, often referred to as the "California Riviera." Nearby is historic San Juan Capistrano and the Mission; Dana Point Harbor where you can picnic, fish, sail, whale watch, and rent jet skis, kayaks, and stand-up-paddleboards; and the beautiful beach art community of Laguna Beach. San Clemente is located midway between Los Angeles and San Diego and just an hour's drive from Los Angeles and Disneyland to the north, and Sea World and the San Diego Zoo to the south. San Clemente is described as a Mediterranean "Village by the Sea." San Clemente is a small beach community with most businesses located on one main street that leads to the main beach and pier. We now have the newest Outlet Mall in Southern California, which is only a 5 minute drive away. toilet, With vanity on first floor. Just open the windows for a cool sea breeze. radiant heating and portable electric heaters. We provide clean bed sheets, pillows and pillow cases. Parking for one car inside and one car in driveway. We provide bath towels, hand towels and washcloths. 2 leather full sized sofas, love seat, and easy chair seats 9. Adjoining dining area seats 6 at the table and 3 at the bar. Interactive flat screen 32' connects to our WiFi so you can stream movies from your Netflix or other accounts. DVD/VCR in living room and bunk room (not Blu-ray). Small reading library with shared novels. Nice "Duplo" set available. We also provide a variety of and ice chests, beach and sand toys and wagons to haul it all down to the beach. Large, tiled, roof-top deck with gas BBQ, outdoor furniture and umbrella for dining and view. Boogie Boards and a selection of about a dozen wet suits of various sizes and fishing gear is provided. Surfboards available for rent very reasonably upon request and reservation. Laundry facilities are shared coin-op washer and dryer located in the garage. This was our 3rd time renting this place. The house has everything you could need or want. It’s minutes away from the beach or the minutes away from the shops. Lots of beach toys available and chairs for a good day at the beach. Looking forward to going back! The house was perfect for my family of 6 (10 yo son, 8 yo daughter, and twin 4 yo daughters) to get away for the Thanksgiving week. Lots of sand toys, chairs, umbrellas ready to go, and you're only two blocks from the pier. The rooms were clean and the bunk beds were perfect for my youngest. Bill was super responsive and very good about communication. We had a great time at your property. It was a short walk to the beach and to the shopping area. The grandkids had a great time at the beach and watching the trains go by. Wish the house was not on such a busy street, the voice level was high during the day and early evening. We love spending the 4th of July in SanClemente and this location is perfect! IT'S EVERYTHING it said it was! We needed a place that was in between Los Angeles and Oceanside. We found San Clemente a wonderful town ( need to come back and explore more) and William's condo was lovely. It was spacious, the beds were comfy and the showers were wonderful. I would definitely recommend and would stay here again! Thank you! San Clemente is located midway between Los Angeles and San Diego and just an hour's drive from Disneyland and Sea World. Also very nearby is Mission San Juan Capistrano and Dana Point Harbor where you can picnic, fish and rent jet skis. CANCELLATION POLICY: Your reservation deposit is 100% refundable (minus credit card fees if any) until 30 days prior to your arrival date. More details are available upon inquiry. MID-TERM RATES: We also offer special discounted rates for stays of 12-29 nights for $155 per night. LAST MINUTE RATES: Ask about our last minute discount for bookings one week or less prior to arrival.